The BBC gleefully reported that the Greek Prime Minister, George Papandreou, was expected to resign after an emergency cabinet meeting this afternoon. They must have been very disappointed to hear that the rumour was untrue. According to the BBC, Greek MPs are worried about the EU cutting off the money supply which "would give the heavily indebted Greek government 130bn euros (£111bn; $178bn) and a 50% write-off of its debts, in return for deeply unpopular austerity measures". You can't blame the EU-funded BBC for trying can you? The €130bn isn't a gift, it's a loan. As in, they would be expected to pay it back. And the 50% debt write-offs would be from private banks and investors, the largest proportion of which are Greek. So Greek banks will find themselves downgraded and undercapitalised and assuming they survive intact, they will be forced to lay off large numbers of staff who then won't be working and won't be paying taxes (not that many of them do anyway) to help pay back the €300bn loan. 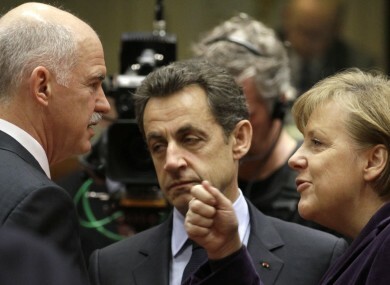 Sarkozy and Merkel summoned Papandredou to a meeting to dictate to him what he can and can't do in his own country. Greece has been threatened with expulsion from the eurozone, expulsion from the EU and the EU is withholding bailout money it has already agreed until after the referendum. Greece needs to leave the eurozone and the EU, re-establish the Drachma at a weak rate rate and slash interest rates but its politicians are wedded to the EU as a source of "free" money and the dream of a continent-wide Soviet republic, so the threats - despite being just what Greece needs - are diplomatic blackmail. The EU is attempting to bully the Greek government into not holding a referendum on the bailout and to bring down George Papandreou. Merkel and Sarkozy are acting ultra-vires - they and the EU have no authority to try and bring about regime change or prevent national governments from holding referenda. The EU - and in particular, France and Germany - are out of control.